Figure 1. Inflation rates since 1913. The dates for which the US was on a gold standard are shaded gold. The US operated on a fixed exchange rate regime until 1973, with brief exceptions in 1914, 1917, and 1935. John Cochrane wrote this post about "a modern adaptation of the gold standard." He gives a lot of deference to Ron Paul-type gold bugs, which was totally undeserved--here's a translation of his thesis into plain English: gold bugs, you're all very wrong, but a price-level target would be nice. As a general proposition, Cochrane's position is not all that unreasonable. He's saying that the Federal reserve should target 0% inflation, instead of the 2% target it has had since the 1980s. As one of my new favorite blogers David Andolfatto alludes to here and here, many macro models--if you have that much faith in them--imply that the optimal monetary policy is a constant price level target rather than an inflation target greater than zero. Why? In Andolfatto's, and presumably Cochrane's, models, surprise changes in price level represent risks to investment, which thus reduces the willingness of households to lend and invest, reducing overall wealth. I think some things are missing from that analysis. For one thing, if we have an increase in the price level that is fully anticipated--not the surprise increase Andolfatto refers to--then there is no efficiency loss in either Andolfatto's or (presumably) Cochrane's models. So the whole argument for price level instead of inflation targeting hinges on the idea that the variance of price level relative to the expected price level is higher when inflation averages higher than when inflation averages 0%. In practical terms, they are assuming that higher inflation means more variable inflation--the harm comes from the variability, not the level, of inflation. Is this assumption born out in the data? 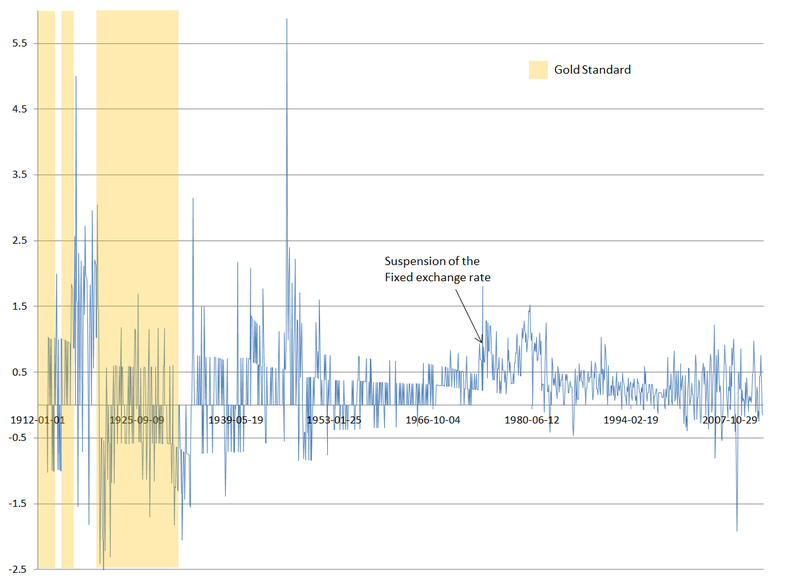 It certainly is true that inflation was higher on average in periods not on the gold standard than when we were on the gold standard (notice the near-total elimination of deflation following the end of the gold standard). But volatility in inflation has decreased rather than increased--yeah, there are large spikes during the two world wars, but these are exceedingly rare. By and large, the upper-bound on inflation after the gold standard is pretty close to the upperbound during the gold standard, with the main difference being a substantial decrease in the volatility of inflation after the gold standard (resulting from the elimination of deflation). This suggests to me that constant price level targets actually increase price volatility: the price level target does not significantly reduce the peak inflation rates, meaning that central banks frequently have to react with severe deflation to maintain the price level target, the result being much more volatility. 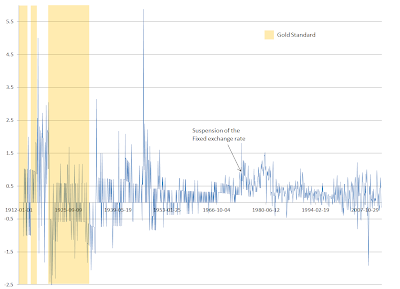 Here's the facts: the standard deviation of monthly inflation from the resumption of the gold standard in 1919 to its final abolition in 1931 was 0.99; the standard deviation from 1931 to 2012 was just 0.5--and that includes the massive spike during the war! Now, that story changes a bit when you start talking about New Keynesian models with nominal price rigidities. With Calvo pricing, for example, there is a loss from the absolute level of price volatility, even if firms can perfectly anticipate inflation. These losses would be smaller with a constant price level target than a constant inflation target; however, the New Keynesian model predicts severe loss of efficiency from deflation, due to a combination of the effects of the zero-lower bound on nominal interest rates, and the fact that with price rigidity, prices cannot perfectly equilibrate supply and demand, leading to large losses of output if deflation is not accompanied by lower interest rates (ie, the zero lower bound). Thus, the optimal policy in the New Keynesian model, even though there are costs whenever there is non-zero inflation, is one that delivers a positive amount of inflation during negative demand shocks (whatever these might be).